Parker Arts is teaming up with Parker Theatre Productions, the folks who brought you Guys & Dolls, Oklahoma! 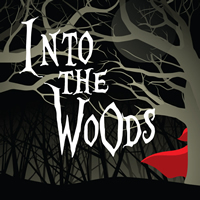 and Fiddler On the Roof, to present Stephen Sondheim and James Lapine's Into the Woods: a modern musical look at the beloved Brothers Grimm fairy tales. In their desire to reverse a curse cast by a witch that has left them childless, a baker and his wife must find the ingredients to remedy their situation. Follow Cinderella, Little Red Riding Hood, Jack (who climbed the beanstalk), Rapunzel, and the baker and his wife that tie them all together as they go into the darkness of the woods.